This massive compilation of d66-dressing files clocks in at 52 pages, 1 page front cover, 1 page blank inside of front cover, ½ page editorial, 1 page blank inside of back cover, 1 page advertisement, 1 page back cover, leaving us with 46.5 pages of content, so let’s take a look! 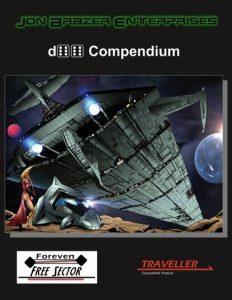 Okay, so this book is nominally designed for use with the Foreven Free Sector and the Traveller game, but it is de facto a system neutral dressing book that is just as useful for Starfinder, Ashen Stars or any other SciFi RPG, really. While the names later reference races and worlds, these are easily reskinned for a suitable race in your game’s context. It should also be noted that this is a compilation of the smaller d66-files released by Jon Brazer Enterprises – so unless you want print and/or all in one place and already own the constituent files, this may not be what you want. The well-made organization may also help in making this worthwhile…but you’ll see. If you have so far not taken a look at the series, though…well, let’s just say that there is a lot of ground to cover, table-wise, so let’s start! After a brief and concise introduction to the subject matter at hand, we move in from the larger scale: After a really nice piece of b/w-artwork, we begin with ship names – a total of 6 d66-tables, to be precise – the tables are organized alphabetically and provide a refreshing diversity regarding nomenclature employed. Under the letter “A”, you can e.g. find “Admiral Nelson”, “Agape” (perfect for pretentious pricks like yours truly), “Asteroid Dancer” or, rather funnily, “Always Something.” Functionality-driven names can similarly be found, btw. – the tables generate, as a whole, a nice mix of different naming aesthetics, a leitmotif you’ll see repeated in other tables as well. The next table sports something different: “Damage to Abandon Ships” – pretty sure that there’s a typo here and that it’s supposed to mean “abandoned ship”…or it’s weirdly phrased and is supposed to denote damage sufficient to cause the crew to abandon ship. Either way kinda works, but from the entries, I consider the former interpretation to be more likely: From EMP-damage to gaping holes in cargo sections and “Griffitti”[sic!] throughout the interior, the entries are neat, but point towards an already wrecked ship. Slightly weird from a formatting perspective: The next 4 table-headers are not bolded, unlike all other headers in the book – but that remains an aesthetic quirk. Speaking of which: The next d66 table would pertain ship quirks, which include fogged up windows in jump-space, low ceilings, panels that fall off – some delightful pieces of local color here. Speaking of which – there is a d66-table of random things to find in a ship’s hold, which include 3D-pictures, anti-telepath helmets, pink ruffled dresses, 20 inflated helium balloons…from the standard to the weird, there are some nice ideas here. After another nice piece of b/w-art, we move on to planets and bases: We begin with two d66-tables of planet names and move on to one table for moon and comet names each. More uncommon would be the objects orbiting a planet, which also get their own table. Here, you can find e.g. “X-Boat and tug”, survey ships, wrecks…some nice adventuring potential. We also get two different tables to randomly choose space station names and a rather interesting one: The exotic atmosphere table primarily uses our elements and notes pressure in general categories…but we can also find one entry that contains flatus gases and one that sports an unidentifiable, purple haze… On the planet itself, a d66-table to determine planetary governments can be found alongside a table of unusual local laws: These are, btw. really funny at times: Sales of 20-sided dice being heavily taxed, worshiping lobsters, a requirement for life guards to be blond…some funny entries here, though serious ones can also be found: From youth being required to remain silent while elders speak to not showing soles or a ban on eating cheese on Tuesdays…some interesting entries here. 2 d66-tables provide different main industries, while another provides spaceport city names – conveniently located next to sample city smells. Speaking of convenient: It makes sense to have the entry for spaceport bar names and the names for alcoholic drinks next to another. The next chapter deals with people and groups: We get one table of MegaCorp names (Including the Hyrul Triforce Group…or, more seriously, the Tungsten Metallurgy Manufacturing corporation) and one for shipping corporations. Names for planetary survey teams are next and then, we get a table of sample graffiti. Two tables of mercenary corporation names are next…and if you required some neat emblems for organizations, agencies, etc. – well, these is a table devoted wholly to that here as well. A table of tattoos that can be found as identifiers (or simply art) would be up next – and, since the yakuza connotations may remain, we move on to fonts for organized crime and sample names for organized crime bosses in the next table. The final chapter is devoted wholly to generating character and NPC names: Vilani male and female names, with 2 tables of last names and the same amount for the Solomani, Zhodani and Sword Worlds are provided. The pdf then provides tables for Aslan, Vargr and Dhroyne names – but only one table for male and female, respectively – though, helpfully, the names are depicted as how they are pronounced, not how the respective race would write them. The pdf closes with a handy, alphabetic index of tables. Editing and formatting, for the most part, are very good. While a few typos have found their way into the pdf, they aren’t that numerous. Layout adheres to a printer-friendly no-frills b/w-standard, with either one or two tables per page, depending on the respective entry-length. Interior artworks are pretty nice pieces of b/w-artworks. The pdf comes fully bookmarked for your convenience. Dale C. McCoy Jr. & Albert “GamerDude” Beddow Jr. deliver an interesting dressing book. Now, there are two roughly types of dressing books: One would be the generator, which allows you to create something from scratch, building on previous steps in the generation process, usually featuring interlaced tables that influence one another. The second would be what I’d consider alternatively the book to fill in what a referee hasn’t prepared in advance or the imagination jumpstarter. This book, obviously, fits squarely in the second definition. If you expect a series of generators to detail certain aspects of the game from the big picture to the small, then this may not exactly be what you wanted. If, however, you often find yourself caught off-guard by PCs asking for models, manufacturers, details about your game’s window-dressing, then this will be a boon. Never gave a name to that weirdo the PCs are questioning? There you go. They want to have a drink and ask for the local specialty? You’ll know it. They want to know the model of the killer’s weapon, left behind? The one you never thought about until it became their main line of inquiry? Well, now you have the names at the flick of your wrist. My final verdict? Well, I consider this dressing book to be very much worthwhile for a scifi/space opera game; it is a nice filler for the blanks that we often leave unintentionally. Its organization is good and the names per se are crisp, though it should be noted that there are perhaps a bit many names for some folk’s tastes, but then again, that may be just what you’re looking for. As a whole, I consider this to be worth getting. My final verdict will hence clock in at 4.5 stars – though, to me, the book misses excellence by a mark, which is why I’ll round down. You can get this nice space-dressing book here on OBS!